Enric Sirera, Ultrasion, explains how ultrasonic moulding has come of age as the technology of choice for OEMs seeking to innovate and push the boundaries of product design. Medical device OEMs face numerous challenges, not least the development of smaller and smaller products and components with greater functionality. Miniaturisation of medical devices is driven by the requirement for less invasive interventions, and the pan-industrial push towards cheaper and lighter products. There are particular areas where continued requirements exist for efficacious parts that are as small as possible, for example in various in vivo diagnostic applications such as embedded sensors, in the development of intravascular ultrasound catheters, and for numerous micro-invasive technologies treating a variety of chronic medical conditions. Whether product designers are focused on such cutting edge developments, or are striving for miniaturisation in other areas of medical product development, often there is a limit on product design parameters from the nature of (and availability of) cost-effective manufacturing alternatives. 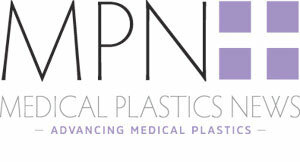 In the area of plastic medical device manufacture, OEMs have until recently been faced with using fabrication processes that are iterations of technologies that have been used for decades in larger scale plastic product manufacture. Plastic micro-injection moulding technologies now exist that cater for the manufacture of smaller and more precise plastic parts, but they are still based upon the traditional screw, barrel, and heater-band technology that has been in existence for decades. The basic underlying process of plastic pellets being placed in a hopper, melted in a heated barrel, and then injected into the mould (often through a cold runner system) has remained the same. Injection moulding on any level has inherent drawbacks in terms of material wastage, energy usage, and expensive tooling – drawbacks that are exacerbated as the size of moulding decreases. In recent years, an ultrasonic moulding technology has become commercially available that addresses these drawbacks, but of critical importance to medical device OEMs, also opens up areas for innovation as it imparts advantageous characteristics in the melted plastic, allowing OEMs to design and manufacture longer, flatter, thinner, more feature-rich, and increasingly complex micro parts than has been possible before. When looking at ‘design for manufacture’ (which is a phrase often heard when discussing small plastic parts), ultrasonic moulding allows the writing of a new chapter, as the limits of what is possible have changed. Four years ago, Ultrasion introduced the first ultrasonic precision moulding machine to industry. Since then, this ultrasonic moulding has become the ‘go to’ technology for medical OEMs (and indeed OEMs in all sectors where precision and repeatability is key), when the parts required cannot be manufactured on traditional precision moulding machines. In the area of precision moulding, material degradation is perhaps the key issue for manufacturers of plastic parts. Material degradation is a product of residence time, and residence time is itself a product of the screw barrel and heater band configurations found on all traditional moulding technologies. Ultrasion’s ultrasonic precision moulding technology was primarily developed to overcome the problems associated with material degradation by eliminating residence time. To achieve this, the technology was built from the ground up without screws barrels and heater bands, and instead of the material being heated in advance of injection into the mould, it was melted in situ in the mould right by the gate, and only the amount of material needed per shot was processed. This reduces the thermal history of the plastics to milliseconds, dramatically reduces waste (as only the amount of material needed per shot is processed), and eliminates the need for material purging. Having addressed the problems of material degradation, it was in addition found that processing polymers with ultrasonics led to other advantages. Key among these was that melting through ultrasonics dramatically reduces the viscosity of the processed polymer. In most instances polymer melted by ultrasonics is almost the consistency of water, and this allows for much better flow through the mould using dramatically reduced moulding pressures. Today, as the technology has evolved it is the advantages inherent in low pressure moulding that is the key to success of ultrasonic precision moulding. Ultrasion’s technology uses moulding pressures of between 250 and 400 bar compared with the typical 2000-2500 bar used in traditional precision injection moulding machines. The possibilities that this offers manufacturers of precision plastic parts are obvious. An array of over-moulding and insert moulding applications can be accommodated using ultrasonic moulding that would be impossible on traditional moulding machines. In addition, through the use of vastly reduced moulding pressures, manufacturers are able to mould around extremely delicate core pins, or tricky core pin configurations that would deflect or break under usual moulding pressures. The advantages inherent in ultrasonic moulding are best appreciated in the area of precision moulding rather than large scale moulding, and the company is in the process of expanding its ability to accommodate larger shot sizes, but it is unlikely that the process will be advantageous above about 20g shot sizes. It was never designed to make car bumpers! The first commercially produced machine on the ultrasonic moulding platform was the Sonorus 1G which could accommodate a maximum shot weight of 2g. This machine was successfully sold to numerous OEMs throughout the United States, Europe, and the Far East. The demand from industry, however was for a machine that could accommodate slightly larger shot sizes, and so the company introduced the second version (the Sonorus S210 machine) at the 2016 K Show, which has a maximum shot weight capacity of 5g. Ultrasion provides quite a unique offering to customers. Each machine purchased can be designed to order, adapting the basic ultrasonic moulding platform to accommodate different shot size capability, different sonotrode sizes, different amplitudes, different frequencies etc… It is also process optimised to cater for specific materials used in specific applications if this information is shared by the customer. This ensures that the machine delivered is done so precisely manufactured for customer specifications. Increasing the shot weight that can be processed has made ultrasonic mpulding viable in a vastly increased number of applications from across all sectors of industry. Coupled with the fact that the technology can process all materials with equal ease, including tricky and high temperature melt grades of PEEK often used in medical applications, and it is easy to see why ultrasonic moulding has made a name for itself and is a valued alternative to traditional moulding technologies. Ultrasion’s precision moulding technology represents a new and innovative approach to micro plastic part manufacture, and as an alternative to traditional precision injection moulding technologies exhibits significant advantages in terms of the stimulation of innovation as it truly manufactures parts impossible on traditional moulding machines. The nature of the process, and especially the reduced viscosity characteristics that ultrasonics can achieve as the melting agent, opens up the possibility of part design and part characteristics that have hitherto been unattainable. It is here that the interest that Ultrasion is attracting from OEMs across industry is focussed, most especially in the areas of medical devices and microfluidics.